Indoor Swimming Pools NYC – Where to Swim in New York City? What are the Best Indoor Swimming Pools NYC Has to Offer? Where do I find indoor swimming pools in nyc , that is about all I thought about over 7 years ago. I started swimming at the Y, trying lose this weight. I saw some progress back in 2011, but not major, and still hovered in the 270 pound range despite swimming laps. Way to much weight for anyone to handle. So, once I started to swim, I looked around to see if there are other indoor swimming pools in the city. This way, whether you are on the east side or west side, uptown or downtown, you can swim. Here is a collection of the best indoor swimming pools nyc has to offer as well as some popular outdoor pools in the City. And if you want to get fit to improve your health and appearance, check out this guide how to lose 20 pounds in 3 months. Nothing feels better than a cool dip on a hot summer day in the city. New York City has plenty of clean, well-maintained swimming pools that are perfect for sweltering dog-day afternoons. Most of Manhattan's outdoor swimming pools open at the beginning of the summer and close after Labor Day. Find the best New York City swimming pools in your area and dig your bathing suit out of storage. Getting There: 6 train to 23rd St. and walk east or transfer to the M23 crosstown bus to FDR Drive. Cost: The 2 outdoor pools are free. 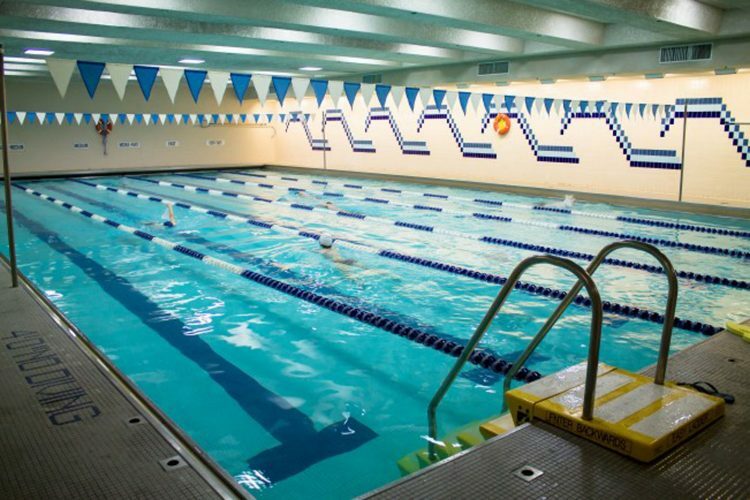 Membership for the indoor pool (and other recreation center benefits) is $50/year for adults, $10/year for seniors, and free for kids and teens under 18. Hours: Recreation center hours are Mon-Fri 6:30 a.m. to 9:30 p.m.; Sat. and Sun. 8 a.m. to 4:45 p.m. Outdoor pool hours are 11:00 a.m. to 3:00 p.m., and 4:00 p.m. to 7:00 p.m. Cost: $50 day passes available for purchase at the front desk. Call for the latest membership fees. Hours: Weekdays from 6 a.m. to 11 p.m. Weekends from 8 a.m. to 9 p.m.
Overview: Great pool for serious swimmers and millionaires. Membership is pricey , but the pool and the sports center are deluxe. Cost: Membership for the indoor pool (and other recreation center benefits) is $75/year for adults, $10/year for seniors, and free for kids and teens under 18. Hours: Recreation center hours are Mon-Fri 6:30 a.m. to 9:30 p.m.; Sat. and Sun. 8 a.m. to 4:45 p.m.
Overview: Check the center schedule for swimming hours. Pool Type: Outdoor pool so the natural lighting is a plus. Hours: Outdoor pool hours are 11:00 a.m. to 3:00 p.m., and 4:00 p.m. to 7:00 p.m.
Getting There: F to Delancey St.
Overview: The pools are very clean with attentive lifeguards. Free swimming lessons are offered in the summer — call 718-699-4219 for more information. Address: 345 Chambers St. between the West Side Highway and the Hudson River. Getting There: 1,2,3 to Chambers St.
Overview: Nice indoor pool with a view. No crowds on most weekdays. Overview: Small, shallow pool is great for smaller kids. A lifeguard is on duty, but kids must be at least 3'8″ and 6 years old. The pool is in Tompkins Square Park, which also features playgrounds, basketball and handball courts, and game tables. Address: 500 E. 9th St. Address: 1 Clarkson St. between 7th Ave. South and Hudson St.
Getting There: 1,2,3 to Houston St. or A,C,E,F to W. 4th St. Cost: The outdoor pool is free. Membership for the indoor pool (and other recreation center benefits) is $75/year for adults, $10/year for seniors, and free for kids and teens under 18. Overview: The outdoor pool can get very crowded on hot days. The Tony DaPolito Center also has very affordable after-school programs summer camps, and sports leagues. Getting There: 2,3 to 135th St.
Overview: Small, shallow pool is great for smaller kids. Address: 555 E. 90th St. at York Ave.
Getting There: 4,5,6 to 86th St. Cost: Drop -in day rates are $35 for adults and $10 for kids (drop-in not available weekdays between 3 p.m. and 8 p.m.). Hours: Weekdays from 5:30 a.m. to 10 p.m. Weekends from 8 a.m.to 8 p.m.
Overview: Beautiful pool with great kids' programs. Explore Asphalt Green. Getting There: 1 to 103rd St. Address: 119 W. 56th St. near 6th Ave.
Getting There: N,R,W Q,F to 57th St. Cost: $50 day pass is available for pool only. Call for current membership rates. Overview: The glass-roofed pool has an outdoor sun deck and food and beverage service. Visit Gravity Fitness Center to purchase a day pass. Address: 2301 Amsterdam Avenue at 173rd St.
Getting There: A to 175th St. Pool Type: Outdoor olympic size pool and wading pool. Overview: Highbridge Park also has spray showers, volleyball courts, baseball fields, playgrounds, fitness equipment, basketball courts, barbecuing areas, and more. Overview: The Hotel Grace is a perfect spot for a pool party and hosts monthly Brazilian Night events. Address: 85 Bradhurst Avenue at 146th St.
Getting There: A,B,C,D to 145th St.
Overview: Jackie Robinson also has an Arts and Crafts room, a computer resource room, two playgrounds, a baseball field, and a basketball court. Pool Type: Outdoor pool with diving and views of the east river . Cost: Suggested annual donation of $25 for adults and $10 for teens. Overview: John Jay is one of the best public pools in Manhattan. A snack bar and playground are nearby. Address: In the middle of Central Park near 110th St. and Lenox Ave.
Getting There: 6 to 110th Street, enter park and walk westward. By bus, take the M1,M2,M3,M4 to 110th Street. Hours: From July 1 through Labor day, it's open daily from 11 a.m. to 3:00 p.m., and from 4 p.m. to 7 p.m.
Overview: This is one of the city's most popular pools and gets very crowded. Address: 482 West 43rd Street at 10th Ave.
Getting There: A,C,E to 42nd St. Pool Type: Rooftop pool with retractable glass roof. Cost:$25 day passes are available (includes use of gym, steam room and whirlpool). Overview: Four-lane lap pool has a separate alcove for kids. Day pass is half the price of the rooftop pool at the Parker Meridien. The MPHC web site offers a coupon for a $10 day pass (workout and pool).